WINNIPEG – Not only were the ice cream vendors hopping in July. REALTORS® were kept busy too with the most active July in WinnipegREALTORS® 111-year history. Close to 1,500 MLS® sales were transacted with a record-breaking July dollar volume of nearly $390 million. MLS® listings kept coming on the market too with more than 2,300 new ones to whet the appetite of eager buyers. It resulted in building a healthy inventory of over 5,000 MLS® listings by month end. July 2014 compares favourably to a good month in June and was only 2% off June 2014 when it enjoyed the third highest sales for this month. This gives credence to comments made at the end of the second quarter that Winnipeg is in a delayed spring market due to a prolonged winter. To show just how record-breaking this July was in terms of sales, July 2014 is only the second time MLS® sales reached over 1,400 sales for this summer month. It outperformed the 10-year average by nearly 200 sales or 15%. Speaking of 200 sales, condominium sales were up 18% over the same month last year at 202 sales. 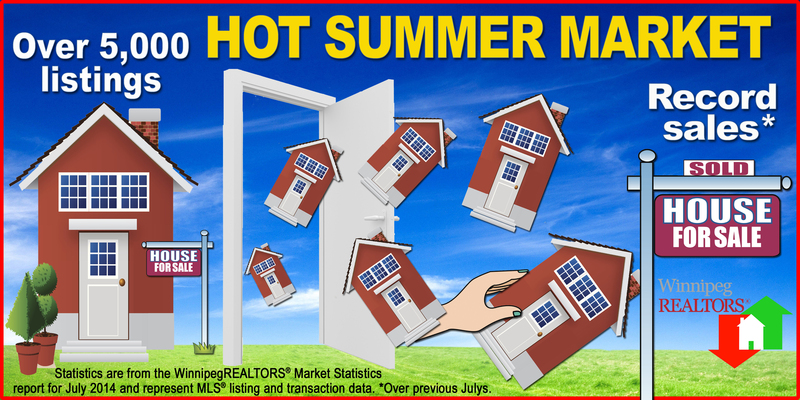 Single-attached which is the strongest MLS® property type performer year-to-date saw an increase in July of 16% over July 2013. Residential-detached or single family homes as a result of its over 7% rise in sales activity from July 2013 is up 3% for the year. July MLS® unit sales increased 7% (1,483/1,388) while dollar volume went up 10% ($388.2 million/$352.8 million) in comparison to the same month last year. Year-to-date sales are now up close to 2% (7,959/7,819) while dollar volume has risen 5% in comparison to the same period last year. 55% of the 14,376 listings entered on MLS® have been converted to sales this year. What does this all mean for the overall MLS® market? It is a more competitive situation for many vendors given how balanced the market is becoming. In July 2014 two out of every three residential-detached listings sold for less than list price where it was less than one in two in 2008. Conversely, for the same number of total sales, there were almost twice as many residential-detached listings that sold above list price in July 2008 compared to this July. Condominiums in July saw even less sales go for above list price but had more sell at list price than residential-detached properties. 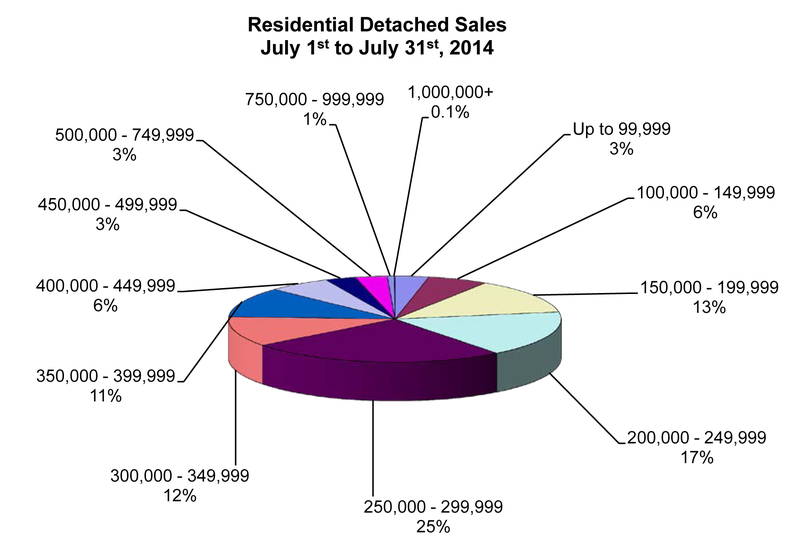 One out of every four residential-detached sales in July sold in the $250,000 to $299,999 price range. Another 30% sold in the two lower price ranges from $150,000 to $249,999. There was a huge divergence in range of sale prices from a high of $2,000,000 to a low of $17,000. The most active condominium price range for sales was from $150,000 to $199,999 at 28%. Not far behind is the $200,000 to $249,999 range at 23%. The highest condominium sale price was $675,000 and the lowest was only $37,500. The average days on market to sell a residential-detached property in July was 28 days, 3 days off the pace set last month and 5 days quicker than July 2013. For condominium sales, the average days on market in July was 34 days, 7 days quicker than last month and one day slower than July 2013.